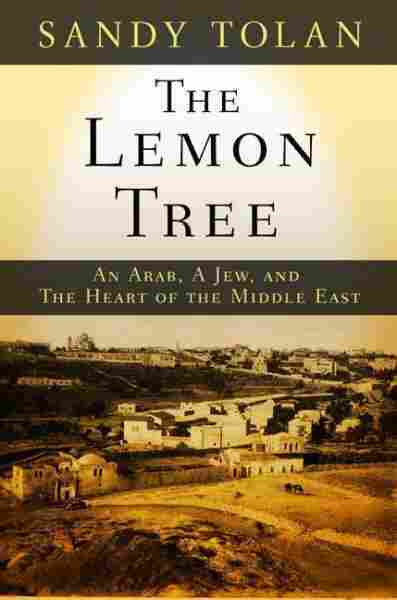 The Lemon Tree NPR coverage of The Lemon Tree: An Arab, a Jew, And the Heart of the Middle East by Sandy Tolan. News, author interviews, critics' picks and more. Describes how a simple act of faith and the relationship between two families—one Israeli, one Palestinian—represents a personal microcosm of decades of Israeli-Palestinian history and symbolizes the hope for peace in the Middle East. February 13, 2009  As a presidential candidate, Barack Obama routinely made promises that he would "restore our moral standing in the world." But, now that he occupies the White House, is his administration unveiling a new era in foreign policy? June 4, 2006  An Israeli woman and a Palestinian man find lifelong friendship in a search for understanding. In The Lemon Tree, Sandy Tolan ties a story of two families and the house that connected them, to the history of the Mideast conflict. May 15, 2006  Sandy Tolan talks about his book The Lemon Tree: An Arab, a Jew and the Heart of the Middle East. The account grew out of a 1998 NPR documentary in which Tolan reported on a friendship between a Palestinian man and an Israeli woman that served as an example of the region's fragile history. The young Arab man approached a mirror in the washroom of Israel's West Jerusalem bus station. Bashir Khairi stood alone before a row of porcelain basins and leaned forward, regarding himself. He turned his head slightly, left to right and back again. He smoothed his hair, nudged his tie, pinched his clean-shaven face. He was making certain all of this was real. For nearly two decades, since he was six years old, Bashir had been preparing for this journey. It was the breath, the currency, the bread of his family, of nearly every family he knew. It was what everyone talked about, all the time: return. In exile, there was little else worth dreaming of. Bashir gazed at his reflection. Are you ready for this journey? he asked himself. Are you worthy of it? It seemed his destiny to return to the place he'd mainly heard about and mostly couldn't remember. It felt as if he were being drawn back by hidden magic; as if he were preparing to meet a secret, long-lost lover. He wanted to look good. "Bashir!" yelled his cousin Yasser, snapping the younger man back to the moment in the bus station men's room. "Yallah! Come on! The bus is leaving!" The two men walked out into the large waiting hall of the West Jerusalem terminal, where their cousin Ghiath was waiting anxiously. It was nearly noon on a hot day in July of 1967. All around Bashir, Yasser, and Ghiath, strangers rushed past: Israeli women in white blouses and long dark skirts; men in wide-brimmed black hats and white beards; children in side curls. The cousins hurried toward their bus. They had come that morning from Ramallah, a Palestinian hill town half an hour to the north, where they lived as refugees. Before they embarked, the cousins had asked their friends and neighbors how to navigate this alien world called Israel: Which bus should we take? How much is a ticket? How do we buy it? Will anyone check our papers once we board the bus? What will they do if they find out we are Palestinians? Bashir and his cousins had left Ramallah in the late morning. They rode south in a group taxi to East Jerusalem and arrived at the walls of the Old City, the end of the first leg of their journey. Only weeks before, these walls had been the site of fierce combat, leading to devastation for the Arabs and the occupation of East Jerusalem by Israel. Emerging from the taxi, the cousins could see soldiers stationed at Damascus Gate, the northern entrance to the Old City. From there the three men turned west and walked away from the ancient walls and across an invisible line. From the Old City, the cousins had walked west, away from the ancient shrines, across the line of an old boundary between nations. Until a few weeks before, this line had divided West Jerusalem and Israel from Arab East Jerusalem and the West Bank. Now, after defeat of the Arabs in the Six Day War, Israeli forces occupied the West Bank, the Sinai Peninsula, and the Golan Heights and were redeployed to defend the new frontiers. Bashir and his cousins had thus found it easy to cross the old no-man's-land and into a territory simultaneously old and new. They had trudged in the heat for several miles, down crowded lanes and past stone houses that seemed oddly familiar. Finally the narrow streets had given way to busy, modern avenues, where the West Jerusalem bus station had come into view. Bashir and his cousins hurried across the concrete terminal floor, past the station agents pushing tickets through metal bars, past the kiosk selling candies, gum, and newspapers in a language they could not recognize. On the platforms at the far end of the terminal stood buses bound for lands they had only heard about: the forests in the north; the southern deserts; the coastal plain. The three men held their tickets to al-Ramla and hurried toward platform ten, where their bus, painted in waves of aqua and white, was ready to take them home. The young woman sat alone at the kitchen table. Sunlight streamed in through the south-facing windows of the stone house. The morning was clear, Dalia Eshkenazi remembered, and the quiet would have been broken only by her sips from a steaming mug of tea or the crunch of her teeth on black bread spread thick with Bulgarian cheese. In recent days, life in Dalia's home and her hometown of Ramla had returned to normal-as normal as could be expected, at least, in the Israel of 1967. The air raid sirens had at last fallen silent, and Dalia's parents were back at work. Dalia, on summer break from Tel Aviv University, now had time to contemplate her emotions of the last few months. First had come the unbearable tension and the trauma before the six days of war. Alien voices broadcasting from Cairo told her people to go back where they came from or be pushed into the sea. Some Israelis thought the threats were funny, but for Dalia, who had grown up amid the silence of unspeakable atrocities, it was impossible to fully express the depths of fear these threats awakened. For a month before the war, it had felt to her that the end was coming. "Not just the disintegration of the state, but the end of us as a people," Dalia remembered. Alongside this fear was a determination, born from the Holocaust, "to never again be led like sheep to the slaughter." Late on the first night of war, Dalia learned that Israel had destroyed the enemy's air force. She knew then that the outcome of the war was essentially decided. Dalia believed God had a hand in Israel's survival and compared her own feeling of awe and wonder with the feeling she imagined her ancestors had when witnessing the parting of the Red Sea. Dalia's parents had never been religious. They had grown up in Bulgaria, married in 1940, survived a pro-Nazi government, and moved to Israel after the war. Dalia was eleven months old when she arrived. Dalia's family had been spared the atrocities in Bulgaria by acts of goodwill from Christians she was raised to admire and remember. Now, she believed her people had a destiny on the land of Israel. This was partly why she believed what she had been told: The Arabs who lived in her house, and in hundreds of other stone homes in her city, had simply run away. The 1965 Leyland Royal Tiger let out a low rumble, then a burst of exhaust, as the bus driver downshifted to descend the hills west of Jerusalem. Inside sat the three cousins, riding toward their hometown. They had boarded the bus in prior agreement not to sit together. First, this would eliminate the temptation to speak to one another, thus reducing any suspicion among the other passengers about their identity. By sitting apart, each cousin could also have a window seat, to take in every inch of the journey home. They sat three in a row, absorbing the scenery. Bashir wasn't sure if he wanted the trip to go quickly or slowly. If it went quickly, he would be in al-Ramla sooner; but if time slowed down, he could more fully take in each bend, each landmark, each piece of his own history. The bus roared up the curving highway toward the crest of the famous hilltop at Qastal; here, a great Arab commander had fallen in battle nineteen years earlier, breaking the back of his people's army and opening the road to the Holy City for the enemy. Beyond the hilltop, Bashir could see stone minarets of the mosque at Abu Ghosh, one of the few Arab villages that remained standing on the road between Jerusalem and the sea. The village leaders had collaborated with the enemy here, and their village had been spared; Bashir looked upon Abu Ghosh's minarets with mixed feelings. The Royal Tiger sped down the hillside, easing up as the mountain walls closed in, then opened to a broad valley below. Eight centuries earlier, Bashir's Arab ancestors had battled the Christian invaders in hand-to-hand combat, repelling them for a time. Along the roadside, Bashir looked out the window to see the burned carcasses of vehicles blown up nineteen years earlier, in a more recent war, and the wreaths and fading flowers laid alongside them. The Israelis who placed these wreaths here were honoring what they called their War of Independence; to Bashir this same event was known as the Nakba, or "Catastrophe." The bus entered the valley, slowed, turned right onto a narrow highway bisecting rows of irrigated wheat fields, and angled up a low rise. As they passed near Latrun, Bashir suddenly recalled a journey made in haste and fear two decades earlier. The details were elusive; he was trying to remember the stories from when he was six years old, events he had brooded about nearly every day for the last nineteen years. Bashir glanced at his seatmate-an Israeli man absorbed in his book. Looking out the window meant nothing to this man, Bashir thought. Perhaps he'd seen it so many times. Decades later, Bashir would recall feeling jealous of the man's inattention to the landscape. The bus hit a bump-it was the railroad crossing. Simultaneously, the three cousins experienced a familiar sensation, grooved into memory by a repetition two decades distant. Bashir and his cousins knew they had arrived in al-Ramla. Dalia finished rinsing the morning dishes, wiped her hands on a towel, and walked to the kitchen doorway, which opened onto the garden. In recent days, since the end of the war, she had been carrying on a silent dialogue with God that she began as a child. Why, she thought, would You allow Israel to be saved during the Six Day War, yet not prevent genocide during the Holocaust? Why would You empower Israel's warriors to vanquish its enemies, yet stand by while my people were branded and slaughtered a generation earlier? For a child, it was difficult to comprehend the trauma of the people who surrounded her. Only after probing could Dalia begin to understand. She had asked her mother: How were the people branded? Did they stand in line? Did it hurt? Why would anyone do these things? Over the years, Dalia's curiosity would fuel her empathy. It helped her understand the silence of the children she grew up with-children she would invite home after school and try to cheer up with her elaborate skits and solo performances in the garden. Through the doorway, Dalia looked out at the jacaranda tree her father had planted amid the flower beds. As a girl, Dalia had loved to water the deep red Queen Elizabeth roses, with their overwhelming perfume. Near the jacaranda stood the lemon tree. Another family had planted that tree; it was already bearing fruit when Dalia and her parents arrived nearly nineteen years earlier. Dalia was aware she had grown up in an Arab house, and sometimes she wondered about the previous residents. Had children lived here? How many? How old? In school Dalia had learned that the Arabs had fled like cowards, with their hot soup still steaming on the table. As a younger child, she hadn't questioned this story, but the older she got, the less sense it made: Why would anyone voluntarily leave such a beautiful house? Bashir, Yasser, and Ghiath emerged from the bus into a hot, glaring world at once bizarre and familiar. They could see the old municipality building, and the town cinema, and the edge of the neighborhood where they were raised. But none of the streets seemed familiar, at least not at first; they all had new names. Most of the old buildings were covered with brightly colored signs in blocky, indecipherable Hebrew lettering. On some of the building archways, the remnants of the original flowing Arabic cursive remained. Suddenly Yasser, the eldest, spotted something he knew: the old neighborhood butcher's shop. He quickly walked inside, his cousins following, and threw his arms around the butcher, kissing both his cheeks in the customary way of the Arabs. "Abu Mohammad!" Yasser shouted in glee. "Don't you recognize me? Habibi, my dear friend, I recognize you! We meet again!" The Jewish butcher couldn't have been more startled. Abu Mohammad had left many years before. "You are right, habibi," the man told Yasser, stammering awkwardly in the language of his visitor. "Once there was Abu Mohammad. Now, no more Abu Mohammad. Now, Mordechai!" The butcher invited his guests to stay for kebab, but the cousins were too stunned by the man's true identity and too distracted by their own mission to accept his offer of food. They walked out, flustered. "You were pretending you know everything here!" Ghiath teased his older cousin as they left the shop. "You don't know anything here!" The three men turned a corner and found themselves in the quieter streets of the neighborhood where they once played. They felt at ease and happy, and they forgot their earlier admonitions about speaking to one another and conversed openly in their mother tongue. They came upon Yasser's house and approached the door; Yasser stepped forward to knock. A woman in her forties came out, looking at them strangely. "Please," said Yasser, "all we want is to see the house we lived in before." The woman grew agitated. "If you don't leave the house, I will call the police!" she screamed. The cousins tried to calm her, explaining their purpose. The woman continued shouting, taking a step forward and shoving them back. Neighbors began opening their doors. Eventually the cousins realized they might soon find themselves in trouble with the local authorities, and they retreated in haste. Yasser drifted along in a silent daze. "It was as if he had no soul," Bashir recalled. "He was a walking body, nothing more." "I cannot accept such a feeling," Yasser said finally. "It is something that I really cannot bear." Soon they came upon the house where Ghiath had grown up. Outside was a large sign they couldn't read and a guard armed with a machine gun. The two-story stone house was now a school. The guard told the men to wait while he went inside, and a moment later the principal came out and invited them in for tea. She introduced herself; her name was Shulamit. She told them they could walk through the rooms when the class period ended, and she left them in her office to wait. There they sat, silently sipping their tea. Ghiath removed his glasses and wiped his eyes. He put them back on and tried to look cheerful. "I can't control my feelings," he whispered. "I know," Bashir said quietly. "I understand." When the principal returned, she invited them to tour the house. They did so, Ghiath crying the whole time. After their visit they left the house and walked in the direction of Bashir's old home. No one could remember exactly where it was. Bashir recalled that it had both a front door and a back door that faced a side street. It had a front gate with a bell, a flowering fitna, or plumeria, tree in the front yard, and a lemon tree in the back. After walking in circles in the heat, Bashir realized he'd found the house. He heard a voice from somewhere deep inside himself: This is your home. Bashir and his cousins approached the house. Everything depended on the reception, Bashir told himself. You can't know what the outcome will be, especially after what had happened to Yasser. "It depends," he said, "who is on the other side of the door." Dalia sat in a plain wooden chair on the back veranda of the only home she had ever known. She had no special plan for today. She could catch up on her summer reading for the university, where she studied English literature. Or she could peer contentedly into the depths of the jacaranda tree, as she had done countless times before. Bashir stood at the metal gate, looking for the bell. How many times, he wondered, did his mother, Zakia, walk through this same gate? How many times did his father, Ahmad, pass by, coming home tired from work, rapping his knuckles on the front door in his special knock of arrival? Bashir Khairi reached for the bell and pressed it.